Karl Shell has been the Thorne Professor of Economics at Cornell University since 1986. Shell has been the editor of the Journal of Economic Theory since its founding in 1968. In 2000,JET opened a second office to handle the increased editorial workload. 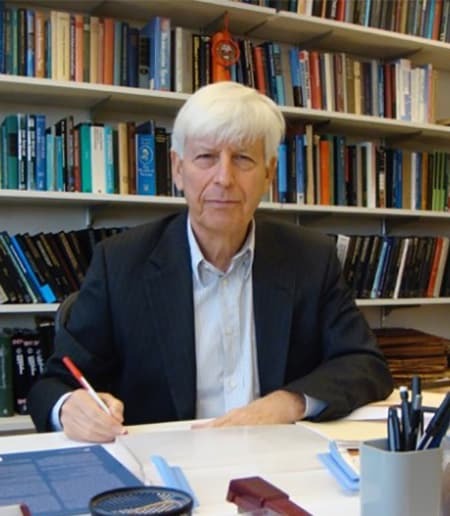 The editor for the second office is currently Christian Hellwig of the Toulouse School of Economics. Shell was a member of the MIT faculty during 1964-68. He was a member of the University of Pennsylvania faculty during 1968-87. Professor Shell received his A.B. in Mathematics from Princeton University in 1960, where he was a student of William Baumol, Ralph Gomory and Harold Kuhn. He received his Ph.D. in Economics from Stanford University in 1965, where he was a student of Kenneth Arrow and Hirofumi Uzawa. Shell is co-inventor with David Cass of the sunspot equilibrium concept. Sunspots provide a rational-expectations explanation for "excess market volatility"; -- the excess of the randomness in outcomes over the randomness in the fundamentals. In nonconvex economies, sunspots can improve the allocation of resources. Shell (1966 and 1967) introduced a macroeconomic theory of inventive activity in which "technological knowledge" is a non-conventional factor of production. It follows that there are increasing returns to scale in all factors (including the non-conventional factor) taken together. Hence purely competitive provision of inventive activity is not possible. Also because of increasing returns, the growth process is history-dependent and permits both explosive growth and contractionary growth. Shell (1973) provides the first growth model in which inventive activity depends on the prevailing industrial organization. In his 1971 JPE paper, Shell introduced the formal general-equilibrium analysis of the overlapping-generations model. He showed that the restrictions on market participation caused by births and deaths are not the cause of "Samuelson's friction." The "double infinity" of endowments and dated commodities is the source of the inoptimality. Yves Balasko and Shell provided the equilibrium and welfare analyses of monetary (and nonmonetary) general OG economies. Balasko and Shell were the first to analyze bonafide fiscal policies, policies that allow money to have positive value. This analysis has implications for retirement of the public debt.